The Michigan House passed Knife Rights’ Switchblade Ban Repeal bill, SB 245, with an non-substantive amendment by a vote of 106-1. The amendment simply provides for a 90-day delay in taking effect after enactment. The bill now goes back to the Senate, where it passed 36-1, for a perfunctory concurrence vote. After that, it goes to Governor Rick Snyder. If you live, work or travel in Michigan, please contact Governor Snyder and politely ask him to “please sign SB 245.” That’s all you need to do, short and simple. SEND AN EMAIL to Gov. Rick Snyder using Knife Rights Legislative Action Center. CALL Gov. Rick Snyder using Knife Rights Legislative Action Center. SB 245 simply repeals Section 226a (switchblade ban) of the Michigan penal code. Help Knife Rights continue to forge A Sharper Future™ by making a donation in the Ultimate Steel™ and you could WIN YOUR CHOICE from OVER $190,000 in Knives, Guns and More! UPDATE: Knife Rights’ MI Switchblade Ban Repeal Passes House Comm. CALL/EMAIL TODAY! The Michigan House Judiciary Committee has passed out Knife Rights’ Michigan Switchblade Ban Repeal bill, SB 245, with a “Do Pass” recommendation. If you live, work or travel in Michigan, please contact your Representative TODAY and politely ask them to “please vote “YES” on SB 245.” That’s all you need to do, short and simple. SEND AN EMAIL to your Representative using Knife Rights Legislative Action Center. 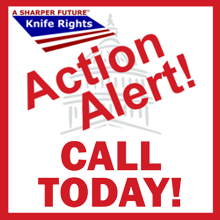 CALL your Representative using Knife Rights Legislative Action Center. SB 245 repeals Section 226a (switchblade ban) of the Michigan penal code entirely. 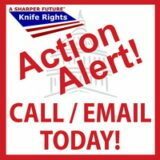 UPDATE: Knife Rights’ Michigan Switchblade Ban Repeal Passes Senate – CALL or EMAIL House Judiciary Committee TODAY! The Michigan Senate has passed Knife Rights’ Michigan Switchblade Ban Repeal bill, SB 245, by a vote of 36-1. Congratulations to our sponsor, Sen. Rick Jones, on getting it passed in the Senate. The bill has now moved over to the House where it has been assigned to the Judiciary Committee. If you live, work or travel in Michigan, please contact the Judiciary Committee members TODAY and politely ask them to “please vote “YES” on SB 245.” That’s all you need to do, short and simple. SB 245 repeals section Section 226a of the Michigan penal code entirely. 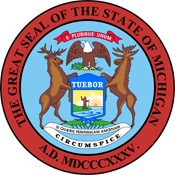 Knife Rights’ Michigan Switchblade Ban Repeal bill, SB 245, was approved by the Senate Judiciary Committee 5 – 0. The bill now heads to the Senate floor for a vote. The bill would repeal Michigan’s outright ban on possession and sale of automatic (switchblade) knives. Knife Rights’ Michigan Switchblade Ban Repeal bill, SB 245, has been scheduled for a hearing in the Senate Judiciary Committee on Tuesday, March 28, at 3 PM. SB 245 would repeal Michigan’s outright ban on possession and sale of automatic (switchblade) knives. Since the sponsor of the bill, Senator Rick Jones, is also the Chairman of the Judiciary Committee, we are hopeful that the bill will pass.